Heather Pierson is an award-winning, multi-instrumentalist, singer/songwriter. From New Orleans Jazz and blues, to rousing Americana and poignant folk narratives, Heather’s live performances move seamlessly and effortlessly from one style to the next. A growing catalog of wildly divergent CD releases reflects her boundless creativity. 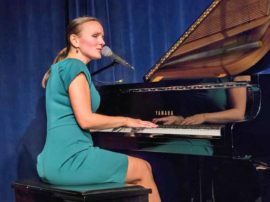 Join us Monday, April 8 at 6:30 in Taylor Community’s Woodside Building for Heather’s virtuosity at the piano, her bell tone vocals and her quiet, yet engaging, stage presence. This event is free and open to the public.